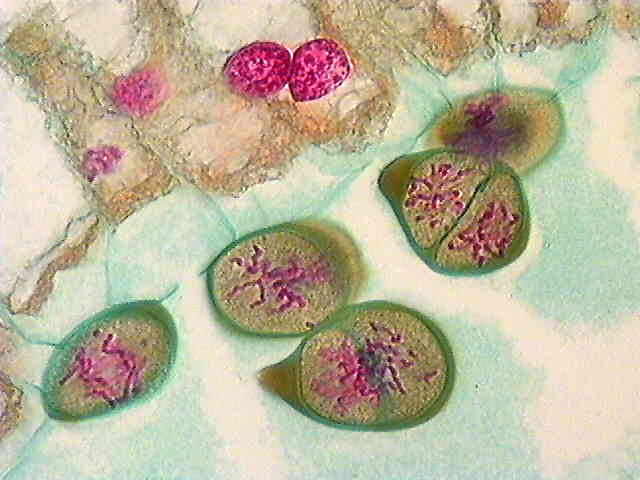 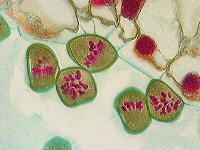 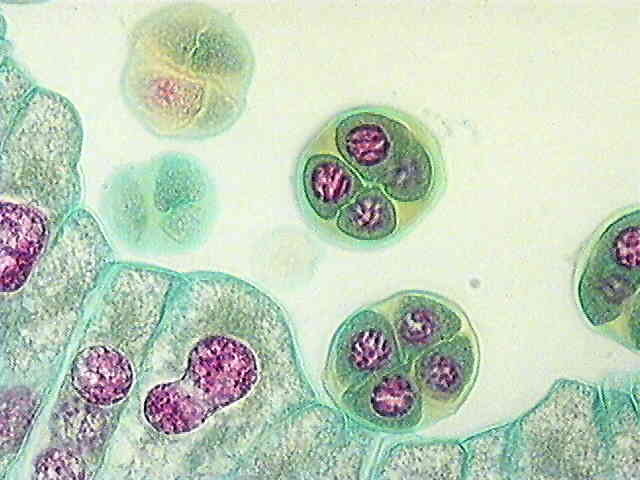 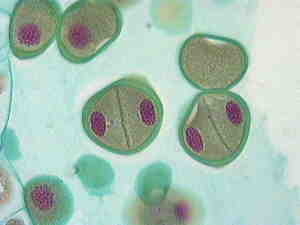 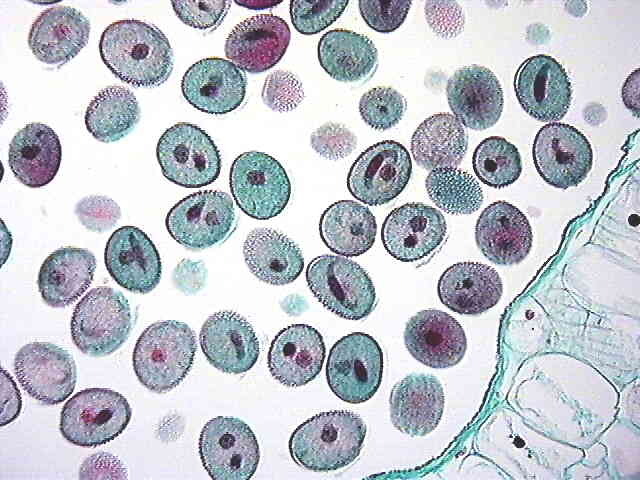 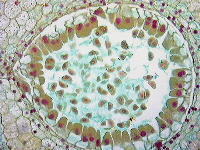 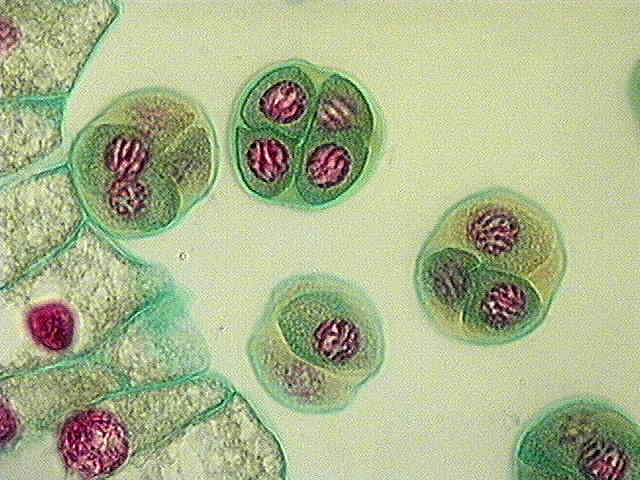 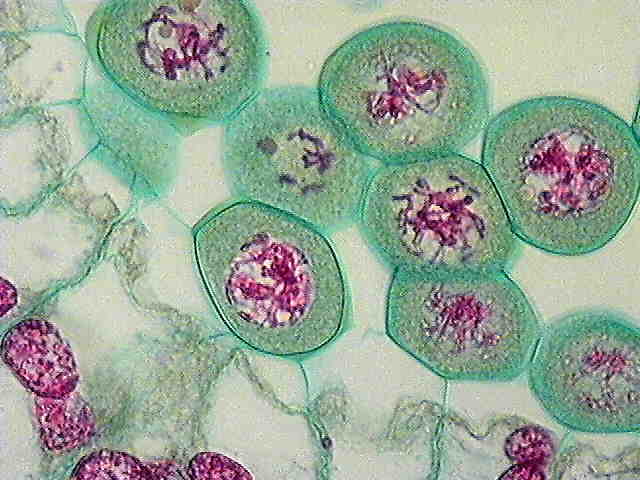 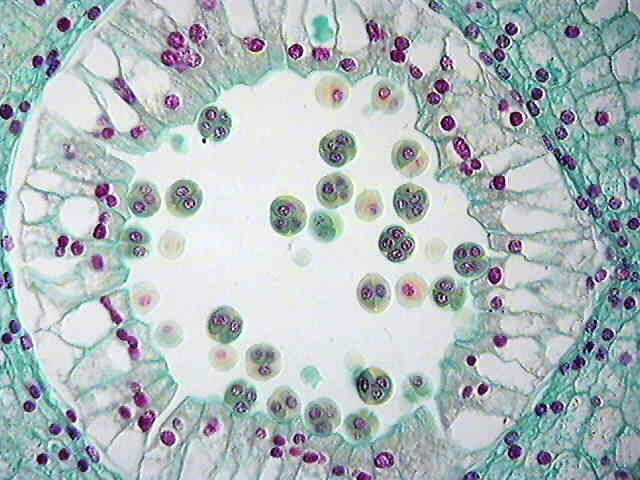 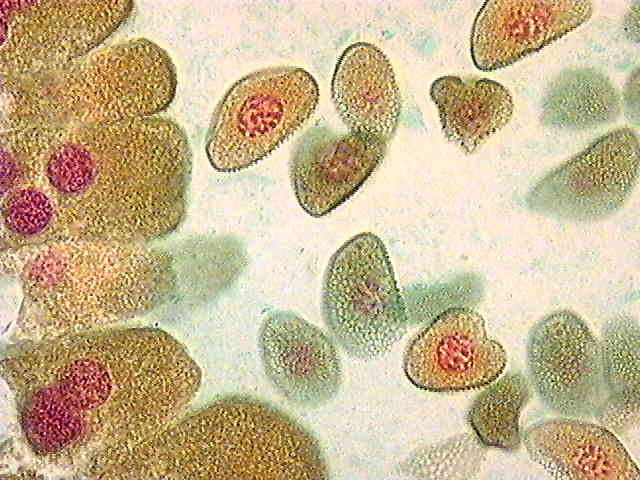 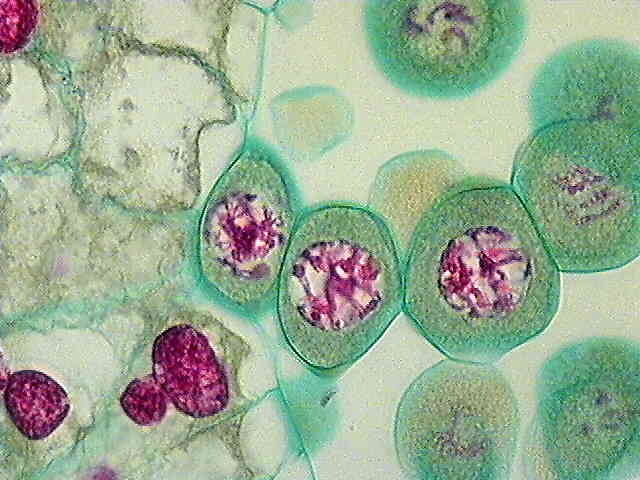 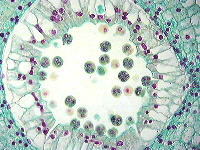 Microsporocytes in early prophase I. 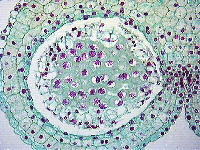 The protracted prophase I is when crossing-over occurs. Much of prophase I consists of precise alignment of homologous chromosomes. 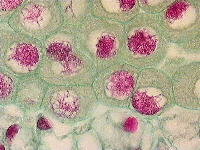 This stage is approaching pachytene, where the chromosomes are highly extended and paired homologous chromosomes exchange genetic material. 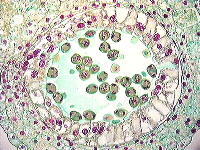 Homologous chromosomes continue to condense into their most compact forms as they near diakinesis. 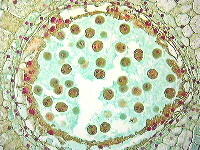 Diakinesis is the last stage of prophase I before metaphase. 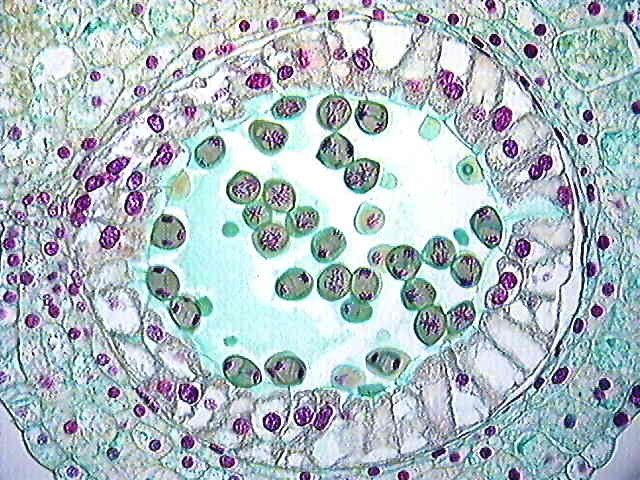 This view shows metaphase chromosome assemblages both in longitudinal view and in polar view (end-on). The homologous chromosomes have migrated to opposite sides of the cell, halving the genetic material. 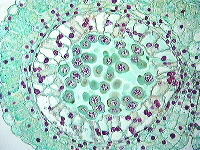 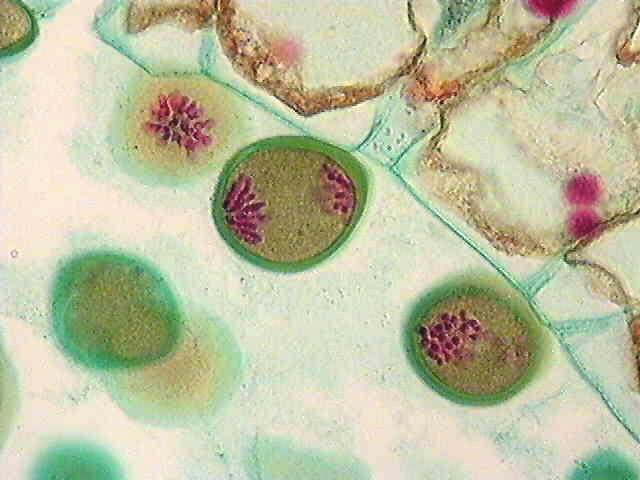 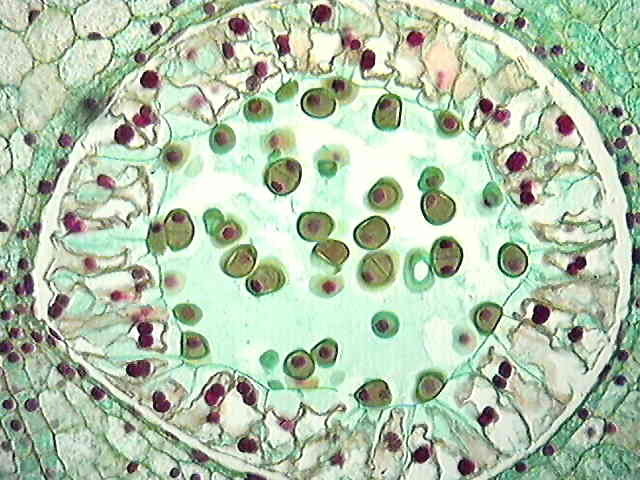 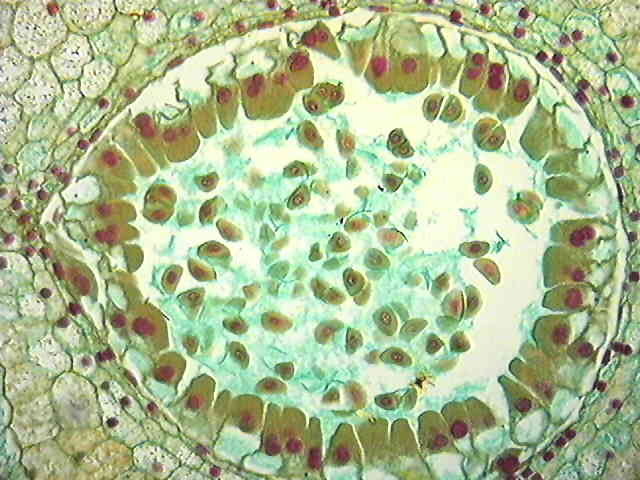 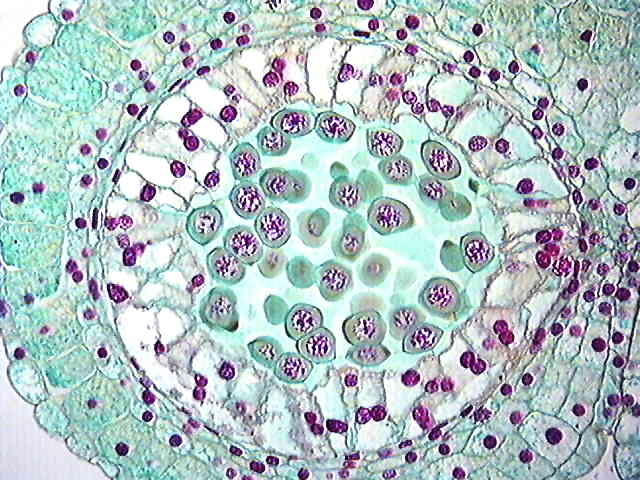 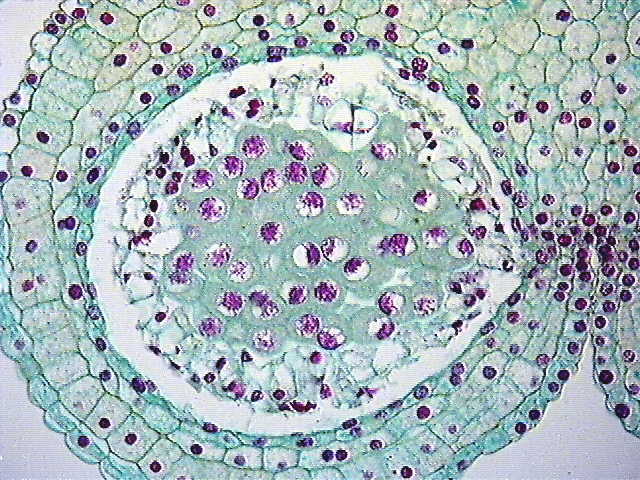 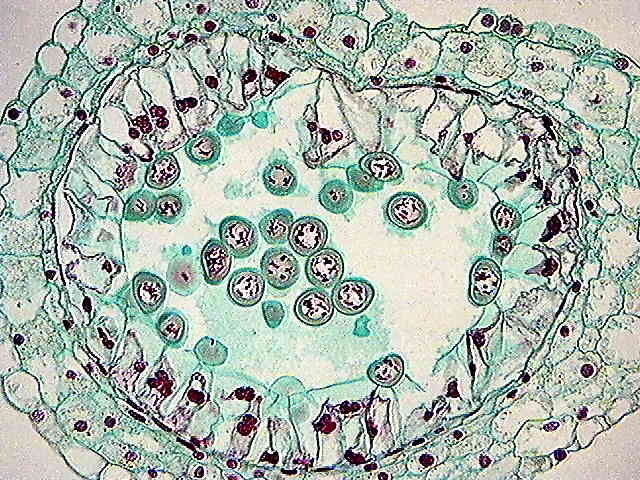 A distinct layer of cell wall is laid down between the two phases of meiosis in lily. 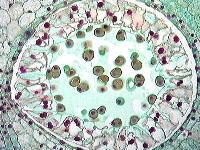 The phases in the second half of meiosis occur rapidly. The chromosomes undergo a separation of chromatids during the second half of meiosis in a cycle similar to mitosis (except for recombination between homologous chromosomes. 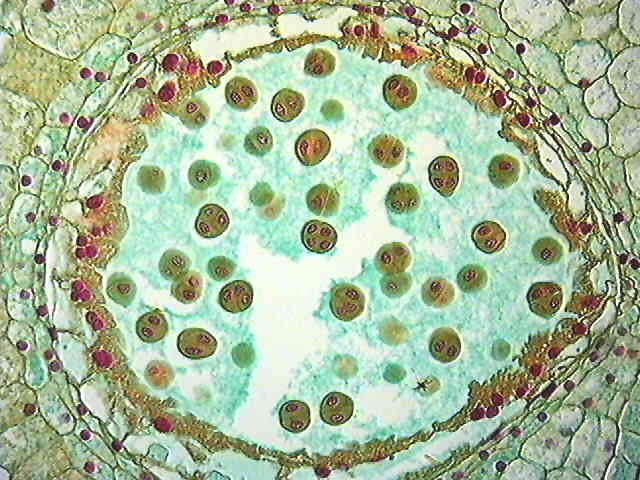 Cytokinesis between the members of the tetrads is completed. 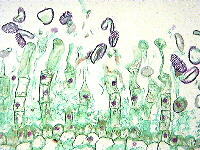 Separation of the cells from the microsporocyte wall occurs soon after. Tetrads in the "callose special wall". Callose forms around the entire tetrad within the old microsporocyte wall. 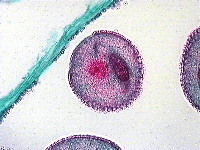 Microspores separate from the megasporocyte wall, become round, and form a primexine -- a precursor template for later exine deposition. Tetrads completing the callose stage. 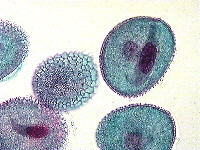 As microspores complete this stage, they elongate somewhat, becoming a bit football shaped. At this stage, microspores have an exine (outer wall of sporopollinin) but are still filling with storage materials and remain pliable for a short time. 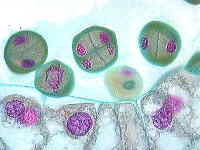 Generative cells are first formed in contact with the intine (inner pollen wall), but the cells then become immersed in the cytoplasm -- truly becoming "a cell within a cell". The generative cell frequently is hooked, but always appears associated with the vegetative nucleus in a "male germ unit." 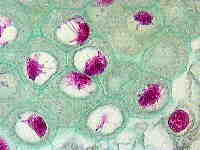 The cytoplasm of the generative cell is dense and so it the generative nucleus, despite the non-motile nature of these cells. 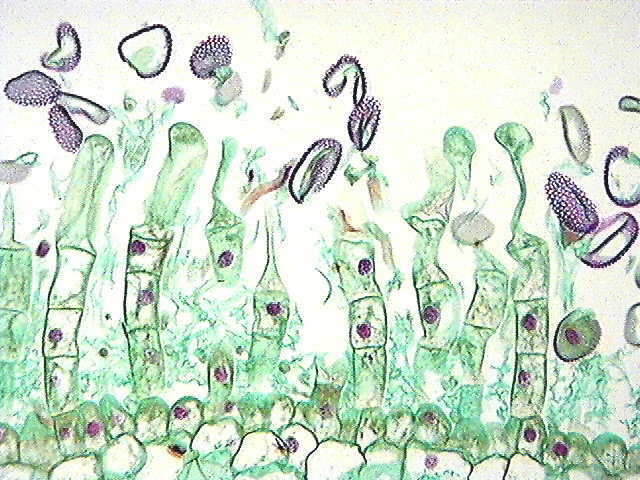 Pollen germination on the stigma. 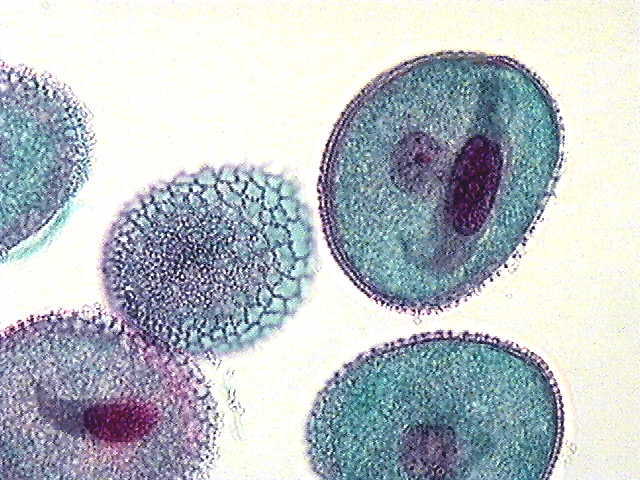 When pollen lands on the stigma, it germinates and forms a pollen tube that continues to elongate until it penetrates the style, enters the ovary and then enters the micropyle and deposits sperm cells in a specific location within the embryo sac.